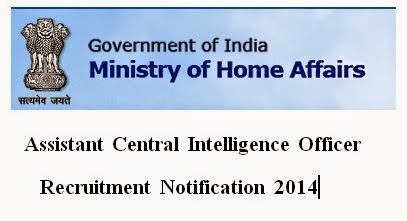 IB 750 Assistant Central Intelligence Officer Recruitment 2014 – Apply online for IB Recruitment 2014. Intelligence Bureau, Ministry of Home Affairs has invites online application for the recruitment of Assistant Central Intelligence Officer, Grade-II/ Executive vacancies under General Central Service, Group-‘C in the Intelligence Bureau, (Ministry of Home Affairs), Government of India. Intrested and eligible candidate may apply online from 11-10-2014 to 09-11-2014. Applicant must apply online mode through website www.mha.nic.in. Applicants are advised to must read full advertisement notification for the post before applying. For more details like post name, age limit, pay scale, fees, how to apply, selection process are given below. Age Limit : Applicants age must be between 18 years to 27 years. Age Relaxation 5 years for SC/ST, 3 years for OBC and continuous service. Educational Qualifications : Applicants must have Graduation or equivalent from a recognized University + Knowledge of computers. Selection Process: Short listed candidates will be called for interview, written test. How to apply: Applications should be submitted only through ONLINE registration by logging on to the website www.mha.nic.in. All candidate first logging on the official website www.mha.nic.in. Now find “On-line application for the post of ACIO-II/Exe in IB’ link. Then Read the notification & instructions carefully. Now fill the details and submit the application form. IB 750 Assistant Central Intelligence Officer Recruitment 2014 Written Examination Admit card will be available on website before exam date. So candidate are advised to keep visiting this website for latest information. Best Of Luck….